Bend Motorcycle Adventures wants to provide customers with bench racing ammo for years to come. Remember those drives home and the conversations about a great day of riding with friends? Can you recall sitting around the campfire and reminiscing about that “one trail” or that close call you had? These are the feelings, emotions and memories that Bend Motorcycle Adventures strives to create when you join them for a tour. Rent one of their top tier KTM dual sports and get ready to rip. Zero Dirt Thirty, Oregon’s only guided nighttime dual sport event, will have you cruising through the cool mountain shadows at sunset while you enjoy an awesome afternoon and evening, guided by your headlight and the starry skies. Ring of Fire is a five-day technical trip that will have your riding through the woods, over lava beds and around ancient volcanos. 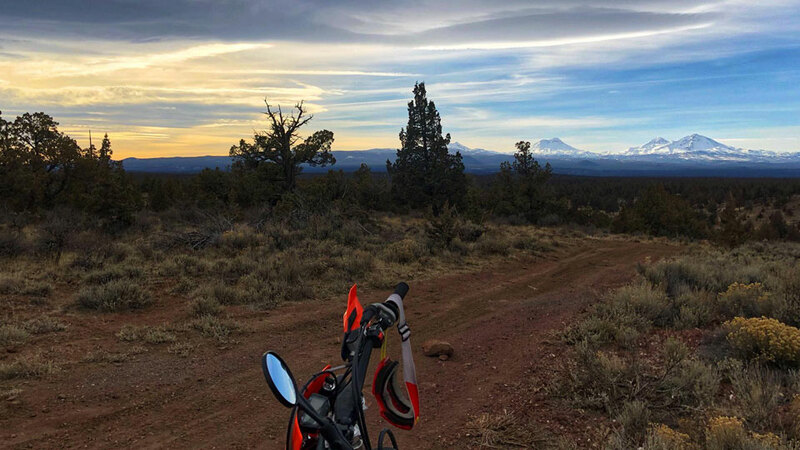 If mixing in roads and sections of pavement isn’t your thing, Bend Motorcycle Adventures has you covered with dirt-only tours that make the most of Central Oregon’s countless riding areas. Pick a tour package or work with the team to customize your adventure. Whether you’re on the dirt or pavement, you’re in for an epic ride with Bend Motorcycle Adventures.